The New Jersey Clean Marina Program provides incentives for participation and marinas that participate in the program enjoy many benefits. In a recent survey of certified clean marinas in NJ, 92% indicated that the Program and certification process helped them comply with state and federal regulations, thus avoiding costly citations and violations. While it is important to note that participation in the Clean Marina Program does not guarantee new sources of income, some marinas that implemented BMPs did realize costs savings and new sources of revenue such as in the sale of oil spill prevention and clean-up products to boaters. Marina owners also found that implementing a more comprehensive recycling program also cost less than traditional disposal costs. Implementing new BMPs can cost money upfront, but long-term benefits to the facility, the industry, and the environment add up. Participating marinas also hear positive responses from boaters and slip holders to the efforts they make to maintain clean, safe, and environmentally friendly facilities. Marina owners, staff and slip holders are proud of their achievements and work together to keep facilities in compliance with the Clean Marina Program criteria. The Program hosts free educational workshops and provides BMP signage free of charge to participating marinas as well as copies of Clean Boater Tip sheets for distribution to slip holders and customers. 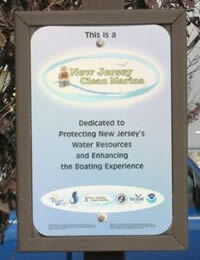 The following marinas have been certified as New Jersey Clean Marinas by the Program Partners. Each facility has successfully implemented sufficient best management practices, earning a Clean Marina score of at least 80%, thus demonstrating a commitment to protecting water quality and coastal resources by preventing and reducing nonpoint sources of pollution. Congratulations to all on your effort and success! View Photo Lockwood Boat Works Inc.
View Photo Morgan Marina, Inc. Ocean Gate Yacht Basin, Inc.
View Photo Robbie's Loveladies Marina Inc.
Jersey Shore Marina and Boat Sales, Inc. The following marinas have signed the Clean Marina Pledge Card (pdf). The marina owners and operators pledge to identify opportunities and implement practices to control pollution associated with activities occurring at the marinas, enhance the surrounding environment and encourage responsible boating practices as recommended in the New Jersey Clean Marina Guidebook. They also pledge to pursue certification as a New Jersey Clean Marina. D&D Sports & Marine Inc.